Trunks: Short; diameter 8 to 12 inches; crown open, broad, rounded or narrow; branches long, slender, spreading; bark thin, reddish-brown to grayish-brown; furrows shallow; ridges narrow, plate-like, sometimes with shaggy appearance. 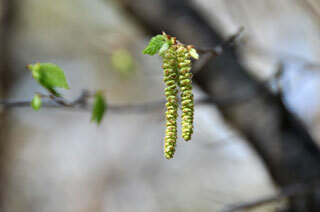 Twigs: Slender, flexible, slightly zigzag, pubescent near tip, initially green, becoming reddish-brown to dark brown; leaf scars 2-ranked, small, crescent-shaped or half-round; bundle scars 3; buds sessile, egg-shaped, 1/8 to 1/4 inch long, pointed; scales 5-7, arranged spirally, reddish-brown. Leaves: Alternate, simple, deciduous; narrowly egg-shaped to elliptic, 2 to 4.8 inches long, 1.2 to 2.4 inches wide; upper surface dark green, dull, glabrous or sparsely pubescent; lower surface paler, pubescent, more so on veins; lateral veins 10-16 on each side of midrib; margins unevenly double-toothed; tip pointed to tapering-pointed; base shallowly heart-shaped to tapering or rounded; stalk slender, 1/6 to 2/5 inch long, pubescent. Fruit: July-September; nutlets, 10-25, arranged in cone-like cluster, 1.4 to 2.6 inches long, 4/5 to 1 inch wide, 4/5 inch thick; each nutlet egg-shaped to elliptic, 1/5 to 1/3 inch long, flat, olive-brown, shiny, enclosed in 2 bracts; bracts egg-shaped, 1/2 to 1 inch long, papery, veined, tan or straw-colored; tips tapering-pointed; stalk to 4/5 inch long. Habitat: Woods on well-drained slopes and ridges, beneath taller trees, borders of moist to dry upland woods, rarely stream banks and flood plains; often on rocky soils. Uses: Native Americans steeped the bark and used the liquid as a wash for sore muscles and held it in the mouth to treat toothaches. A decoction of wood was taken for coughs and kidney disorders. The flowers were used in face-painting. The wood was used to make bows, tool handles, and as building material for dwellings. Comments: The common name hop hornbeam alludes to the fruits, which resemble clusters of hops. Ironwood grows very slowly. The wood is heavy, very strong and hard, durable, pale reddish-brown, with a thick, white sapwood. It is one of the hardest woods found in Kansas, which the common name ironwood alludes to.